After our extraordinary trip to the UK, Italy, Paris and the Somme, we hit the ground running back home. A BA captain brought his family on tour, including his son-in-law who has never been to Africa previously. Observing the delight and wonder of this young man driving on gravel roads, experiencing the battlefield stories and showing him Rhino in the wild was a special reminder not to take our lives, nor our country, for granted. Observing through the eyes of others is most refreshing indeed. Taking our two-year old grandchildren twins to Buffelspoort resort for their birthday was fantastic. Their confidence growing in the warm pools, bright orange arm bands providing the buoyancy, they swam for hours. Driving past Marikana en route provided much cause for reflection. Will Sharpville remain SA’s monster, Marikana pushed under the carpet? For anybody looking for a fine coffee and cake, Die Melkstal in Rustenburg is highly recommended. Clive Foss kindly invited me to an afternoon’s clay pigeon shooting locally. For someone who cannot hit a cow on the arse with a banjo, upon seeing the crowd present, I was afraid I may have been invited along for their entertainment! Anyway, I thankfully never embarrassed myself using a borrowed Silver Pigeon Beretta Over/Under. After prize-giving I was asked to say a few words about Deneys Reitz, which were well received. I am just back from two wonderful days filming in de Hoop Reserve, near Bredasdorp. The old Lekkerwater Lodge hosted many private negotiations between then President de Klerk and Nelson Mandela, before being recently destroyed by veld fires. 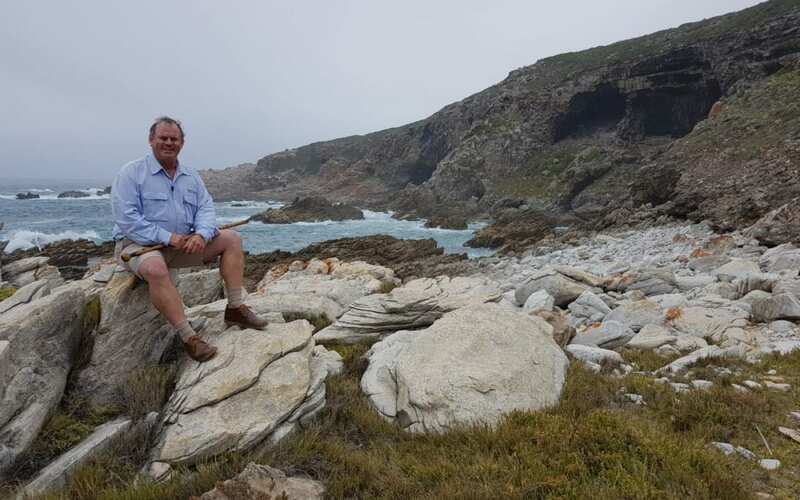 Nearby are the famous Blombos and Klipdrift Caves – found to contain the earliest evidence of Homo sapien existence on Earth, dating back 65-100 000 years. Perhaps most extraordinary is the earliest known evidence of sketching/writing. Professor Henshilwood believes this is created by the “brainpower” arising from a diet very rich in shellfish and fish. So the very birthplace of all modern human beings began on the southern Cape coast, and with it art, science, culture. A new lodge is being built on the Lekkerwater site, due to open on 15 April, and we were engaged in making a promotional video showcasing the lodge and surrounding area. Another of those experiences taking one out of one’s comfort zone, and I loved the whole experience. We leave this next week on a road trip to the Cape, my favourite way of reconnecting with this beloved country. Talks, catching up with friends and family, World RallyX and the lure of the open road make for an intoxicating mix. We hope your year is similarly ending very well indeed.